Reading “how-to” blog posts and guides on SEO (even like our own SEO Basics Guide) can be intimidating as a small business owner. They all talk about spending hours learning about and tweaking your SEO, creating big pieces of viral content, and drawing in tens of thousands of clicks per month. “I’ll never be able to do that!” you think. While many people in the SEO game talk about big numbers and huge, expensive campaigns, that’s not the reality of business for many small business owners. Fortunately, even the smallest of SEO tweaks can make a huge difference for your website, especially for Small Business SEO. Small SEO Steps CAN Make a Big Impact! Instead of throwing a month’s worth of profits into your website, try these 6 things that can help your SEO make an impact for your small business. You may still need to hire someone, and we’ve written an SEO Consultant Hiring Guide for those interested in outsourcing their SEO after they complete these 6 simple tasks that can save you a bit on the SEO fees, provided that you take the time to do a good job. The first step you need to take to help your business stand out from the crowd is to truly nail down your niche, if you haven’t already. Do you only install roofs on commercial buildings? Does your company go after a certain type of client? Do you practice one specific type of law, such as divorces or personal injury? Although it may seem counter-intuitive, finding the most specific niche possible for your business will help you in the long run. If you’re only going after married couples who own minivans, for example, you’ll be able to create more focused SEO campaigns with your keywords, content, and messaging, which means you won’t waste your time talking to people who aren’t going to pay for your service in the end. Become hyper-focused! Google rewards this and your content relevance will improve searcher experience with you site. Having a clear niche and an ideal customer base also helps your potential customers understand your business better. If they go to your website and your content and messaging isn’t speaking to them, they know they’re not your target market. On the other hand, people who see that your site is directly addressing their unique pain points will give you a call or buy your product because you’ve already answered their questions. Once you know your business’s specific niche, you can use that information to choose keywords for your business’s website. Keywords are the foundation of all SEO, as they are the phrases that people type into search engines and, if everything lines up correctly, gets them to your website. If you understand your niche, you can choose better keywords that will help you convert more visitors into buyers. Using your niche to drill down into the ideal type of customer you want helps you focus your content and messaging and draw in the right searchers. The next step toward positioning your small business correctly is to get your branding right. If you’ve just chosen your niche, reevaluate all your current branding – logo, tagline, and any print materials. Does your branding speak to the business that you run? Is your niche clear, or does your branding speak to a more general audience? Does your website copy effectively describe what you do and who you serve? Without clear branding across the board, you’ll be fighting an uphill battle when optimizing your website and other platforms online. Before you do anything else, stop and get your branding in order. You’ll be glad you did! Before you head over to work on your own website, which can be a lengthy task, take some time to optimize the other places online where your business is mentioned. This is called off-page SEO, and it is every bit as valuable – sometimes more – as on-page SEO (changes to your website itself). Search engines pay attention to much more than just your website when determining where you should rank in the search engine results pages (SERPs). These platforms can include your social media accounts, mentions on other websites, and citations in Google My Business, Yelp, and other directories. Search engines look at your business’s entire online presence, including what your customers say about your work (reviews) and what other businesses say about you. Making sure your information (Name, Address, Phone Number, Website URL) and image is as consistent across all these external sources is important to your overall success in small business SEO. Start with optimizing your page on Google My Business, or creating a page if you don’t already have one. Google My Business (GMB) is a free service that Google offers to all businesses that allow you to list information such as your address, phone number, services, and hours of operation. With a GMB profile, you can rank in what is called the Local Pack and gain significant organic traffic. Having the most relevant, well-optimized profile possible helps Google figure out what your business is about and what it can offer searchers, increasing your chances of being seen. Other items, such as individual services or your price range are great additions, too, and only increase your chances of being found by the right potential customers. Google My Business also integrates with Google Posts, a free service that allows you to create short-term posts that appear on your Google My Business listing. If you’ve got a coupon or special, or have an announcement such as adding a new service or a new employee, you can leverage Google Posts to give your business a little more visibility and improve the click-through rate to your website. In the current business climate, reviews are gold for small businesses. Positive, thoughtful reviews help your potential customers see whether your services are what they’re looking for, how your customer service stacks up, and what they can expect from their overall experience. This improves your trust factor with new customers, making them more likely to buy from you. And even if your reviews aren’t all good, as long as you respond to each review apologizing for the inconvenience and working to rectify whatever problem the customer had, potential customers, will see that your business is engaged and committed to customer satisfaction. You don’t need a fully glowing review profile for it to positively impact your business. In addition to gaining customers’ trust, you’re gaining trust with the search engines. They see that people are talking about you and, as long as your review profile is overall positive, you’re more likely to rank above a competitor that doesn’t have a similar review profile. Ask in person. People are far more likely to actually follow through with giving you a review if you asked in person and they said, to your face, that they would. Make it part of your closing process. When you send final bills or wrap-up documents, include a link to your Google or Facebook profiles and ask for a review. The fewer barriers people have to leaving you a review, the more likely they are to follow through. Send a text. If you make communicating with your customers via text a part of your business operations, send a link to your Google review profile in that same manner. It’s easy to click on the link and leave a quick review! 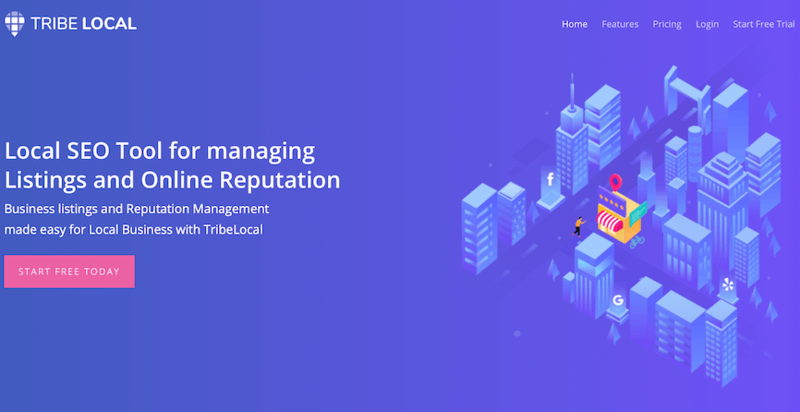 If you want a tool that will help you get citations and assist you in managing reputation, check out friends Tribe Local. They do a fantastic job and make the process affordable and easy. Note: I personally use them. Now that you’ve handled what your customers say about you, it’s time to work on what other business owners say about you. Many backlinks occur naturally, as you create interesting content or you participate in your community and other websites link to you, but there is value in reaching out to people in your industry that you trust as authorities and asking for a link. Backlinks, to the search engines, are small votes of confidence. If another business thinks what you’re saying and doing is important and interesting enough for them to link to your website from theirs, then the search engines give you a little boost. First, find out what kinds of links you have right now. Using specialized SEO software such as Raven Tools makes this process quick and easy; just enter your website’s URL and get a full report of which websites are linking to you. If you see backlinks that look spammy, work to get them disavowed and cleaned up by Google, as bad backlinks can hurt your SEO. If your website isn’t in top condition, it can have a real impact on how many visitors you get and how many of those visitors convert into users. 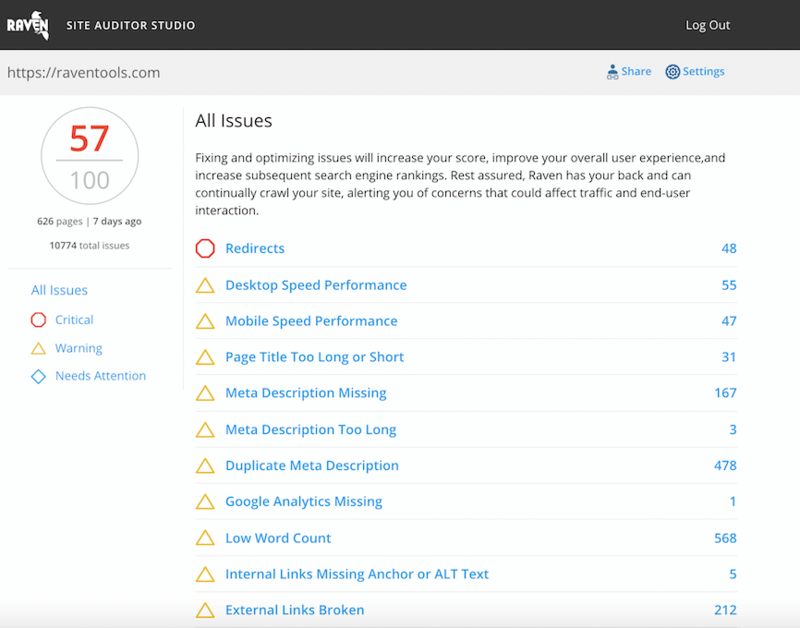 To figure out if technical issues, such as slow page speed or crawling errors, may be causing you difficulty, run a website audit using SEO software such as Raven Tools. You’ll get a report back with all the things that could be creating problems for your website so you can fix them. And if you don’t have the time or the skill to do them yourself, you can hire someone else (like we mention above) to fix the errors for you and get your website in good working condition. 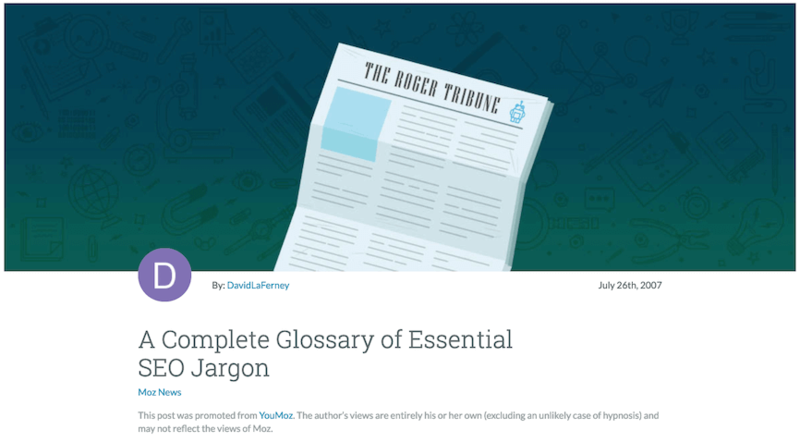 If you’re having trouble understanding any of the lingo above, Moz does a great job compiling a list of all the SEO Jargon. Feel free to keep that tab open to decipher the meaning of terms. The Raven Tools Website Auditor will also describe the issue as you use the tool. Correcting these errors puts your website in a better position to be user-friendly, making people more likely to visit and stay on your website for longer, giving you more opportunity to convert them into customers. One of the things that separates the successful small business website from the less successful ones is content. It’s difficult running a small business and trying to manage your online presence, which is why many owners leave their website by the wayside. But this is a big mistake; your website is a 24/7 billboard for your business, and you need to make sure it’s in top condition. One of the best ways to do this is with the content on your website. Instead of just slapping up some short description of how many years you’ve been in business and what services you offer, taking the time to really think about what your customers want to see when they come to your website can make a difference in your rates of conversion, which improves your business’s bottom line. These are the basic pages on your website. Things such as your homepage, your About page, and the pages where you list and describe your individual services offerings are the bare bones of your website’s presence. When writing these pages, focus on what your customers want and need to hear. They don’t want to hear about how great you are. They want to hear about how you can help them solve a problem or fill a need. Making this mindset switch in writing your web page content can make a huge difference in how your content performs. Many people think of their blog as the place to write the content that goes viral and gets shared on social media. While this is true for some brands, the fact of the matter is, as small business, your content is more likely going to provide a resource for your local customers than it is to go viral to a wider audience. How-to guides. Does your product or service require setup or post-installation care? Create blog posts to guide readers through this process. Answer frequently asked questions. Do you and your team get asked the same types of questions by prospective customers? Keep a list of them and answer them in your blog. Chronicle industry changes. Are there new developments in your industry? Write about them! Go behind the scenes. Customers love to see the faces and hear the stories behind the companies they work with. Profiling your employees, announcing an award your business won, or talking about your company holiday party are great things to include. Your blog is meant to increase brand awareness and provide a helpful resource for your customers, not to explicitly sell your products and services. Sure, you want to create a short call to action at the bottom of each blog post, but avoid, if possible, making all your blog posts sales advertisements for your business. If you’ve got some interesting, insightful blog posts, leverage them in as many ways as possible. Visual, audio, and video content gets shared and read far more than does straight text content. Turn that how-to blog post into a video that walks people through the process you describe, step by step. For blogs that include lists, create an infographic that includes all the points for easy viewing. If one of your blogs would be helpful as a downloadable asset, such as a checklist or a how-to guide, add some extra content and information, turn it into a PDF, and make it something users can download in exchange for their email address. Bonus: Using this method increases your email list, which is a powerful marketing tool! Creating great content isn’t always about making something completely new and different. Sometimes, it means taking what you already have and putting it into a different format. If you own a business, even a small local business, you should have a presence on social media. Now, you’re not going to necessarily be using your social media presence to get lots of leads or make tons of sales. Instead, you’ll use it to build your brand awareness in your community and get your content in front of more eyeballs. This helps you improve your business’s visibility and, in the long run, gain more customers. When you create those great blog posts, you’ll get some organic traffic from people searching. However, you can drive even more traffic to those blog posts by sharing them to your social media profiles. If your followers find them interesting, they’ll click and read. And if they find them especially helpful or interesting, they’ll share them to their followers, amplifying your reach. There’s a lot of value in a solid social media marketing strategy for a small business, but if you’re short on time, knowledge, or resources, that isn’t always possible. At the bare minimum, share your content on your social media channels and engage with your followers when they comment. If you want to give your image a little boost, consider committing to posting pictures of your latest projects every once in a while, or share an interesting industry-relevant article you’ve read. You don’t have to spend all day managing your social media profiles for them to prove some benefit for your business! Investing in your small business SEO is one of the best things you can do to start generating more traffic to your website. While the above tips aren’t anything major, they can still have a huge impact. Work through this list one step at a time and see your website rankings inch higher and higher. Then, when you’re ready, you can level up your SEO status with additional tactics like keyword research, PPC, and SEO content.